Invotra is the leading SaaS provider of enterprise intranet and portal solutions; we serve over 48% of Central Government and are always looking for the next innovation to ensure we stay ahead of the curve. Historically, we have focused on integrating areas such as BIM (Building Information Modelling) and Blockchain into our product, however, our team has gone above and beyond this time with their newest, ground-breaking feature – “Dog Mode”. 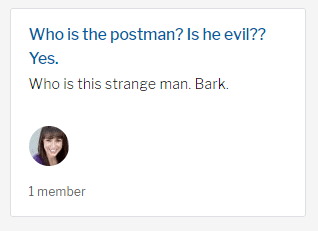 The new feature is focused on allowing people to add their dogs as “K9” users to their intranet, much like adding external stakeholders. The user type comes with limited functionality, allowing man’s best friend to perform actions such as “pawthoring” content, “padministrating” posts and creating groups (pictured below). – Billy Clackers, Product Manager. For more information or to book a demo of our product, click here.